If you have narrow spaces in which to vend products not in need of refrigeration, this is the vendor for you. The SlimGem is a three-wide, non-insulated merchandiser available in various configurations. It is available in either a gray motif or our standard black. It features expanded motor linking, it’s ROHS compliant, it has home-positioning reset. 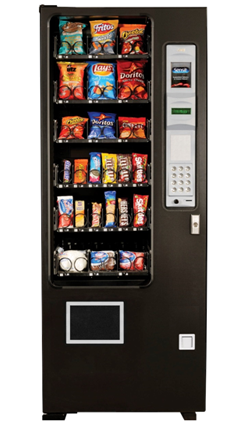 A 3-wide merchandiser for vending non-perishable products.